382 pages | 73 B/W Illus. Part 1: Characterizing and Studying Memory. Nairne, Adaptive Memory: Novel Findings Acquired Through Forward Engineering. Bjork, Forgetting as a Friend to Learning. Neely, Testing and Retrieval Practice Effects: Assessing the Contributions of Encoding and Retrieval Mechanisms. Dunlosky, The Contribution of Processing Fluency (and Beliefs) to People’s Judgments of Learning. Hunt, Using Process Dissociation Procedure to Establish Boundaries of Process Dissociation Theory: The Case of Category Cued Recall. Part 2: Memory and Beyond: Separating Processes. Yonelinas, Dissociating Processes within Recognition, Perception, and Working Memory. Milliken, Event Integration, Awareness, and Short-Term Remembering. Dobbins, Forecasting versus Fitting; Dissociating versus Describing: Celebrating Larry Jacoby’s Methodological Approach to Understanding Recognition. McElree, Memory Processes Underlying Real-time Language Comprehension. Part 3: Cognitive Control. Logan, Memory is Everywhere. Bugg, "Automatic Control" of Interference: Evidence and Implications for Aging. Koriat, Knowing by Doing: When Metacognitive Monitoring Follows Metacognitive Control. Kelley, Constrained Retrieval in Recognition Memory. Lindsay, Recognition Memory Response Bias is Conservative for Paintings and We Don’t Know Why. Part 4: Development and Aging. Craik, Familiarity and Recollections: Interactions with Larry Jacoby. Jennings, Improving Memory and Executive Function in Older Adults with Memory Impairments through Recollection-Lag Training. Sommers, You Aren’t Listening to What I Said: False Hearing in Young and Older Adults. Balota, Attention, Variability, and Biomarkers in Alzheimer’s Disease. Part 5: Clinical, Social, and Forensic Applications. Harrison, Taxonomy of Transfer to Cognitive Abilities: The Case of Working Memory Training. Hertel, Cognition in Emotional Disorders: An Abundance of Habit and a Dearth of Control. Payne, Behavior Priming as Memory Misattribution. Roediger, Understanding the Relation between Confidence and Accuracy in Reports from Memory. D. Stephen Lindsay is Professor of Psychology and Coordinator of the Cognition and Brain Sciences Program at the University of Victoria, British Columbia, Canada. He was Editor-in-Chief of the Journal of Experimental Psychology: General from 2001 to 2007, is currently an Associate Editor of Psychological Science, and in 2015 will begin serving as Editor-in-Chief of Psychological Science. Colleen M. Kelley is a cognitive psychologist with a research focus on memory processes. Much of her work has focused on the interpretation of subjective cues such as fluency of processing in memory and metamemory judgments. She is currently a member of the Steering Committee of the International Association of Metacognition and has served on the editorial boards of a number of journals. Andrew P. Yonelinas is a cognitive psychologist with expertise in quantitative modeling and memory disorders. He is an expert in memory models, measurement methodology, and quantitative analysis. He has published extensively on memory theory, measurement, and memory disorders associated with age-related changes including normal aging, stroke, cardiac arrest, and Alzheimer's disease. He developed a highly influential model of memory retrieval that has become the standard in the field and is featured in several textbooks. Henry L. Roediger, III holds an endowed chair at Washington University in St. Louis, Missouri, USA, and is in the top echelon of researchers in cognitive psychology. 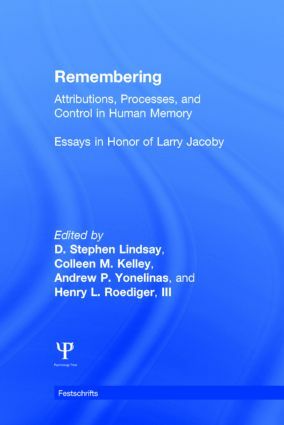 He published highly influential work on "implicit" memory in the 1980s, and in the 1990s he and coauthor Kathleen McDermott popularized and greatly extended a procedure for fostering false memories that had initially been introduced in the 1950s by James Deese. The Deese–Roediger–McDermott or DRM method has been used in hundreds of published studies and it continues to be very popular today.